Valentin Serov was an outstanding master animal artist. Most of all attention in his works, he paid the image of horses. We can see these animals in almost all the paintings of the great Russian artist. Despite the fact that the work is called “George the Victorious”, the main actor is the horse. The first thing we see when looking at a picture is a formidable, powerful figure of a horse. Serov intentionally mutes, darkens the background of the work, making it almost black. Against the backdrop of this gloom, like a thunder in the midst of a clear sky, a violent animal bursts in. Serov depicts a horse in white to emphasize its exclusivity and thoroughbred. It seems that literally in a second the horse will stand on its hind legs and the serpent will hit with its hooves. The figure of the horse is very dynamic, invoice. The large, sharp brush strokes of the master give the animal particular relief. 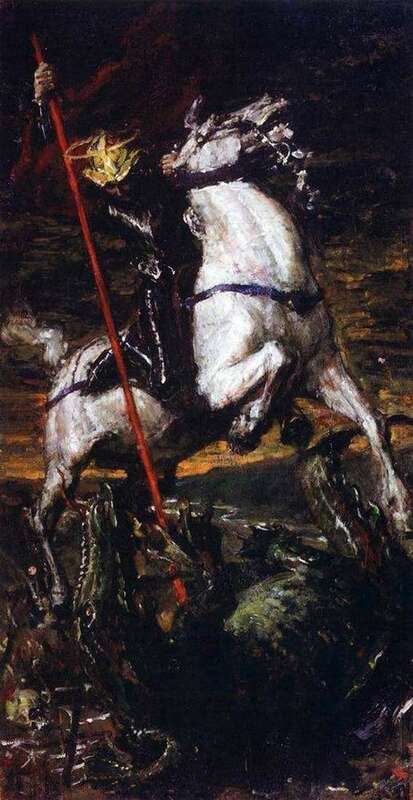 Riding on a horse depicts St. George. It is surprising that the artist depicted the human figure almost imperceptible – it merges with a black background. We can see the massive dark armor on the body of a man. On his head – a bizarre-shaped helmet of pure gold. It is worth noting that Serov depicts a glowing halo over a man’s head, which is always correlated with icon painting. But the master is far away from the canons of writing icons. The picture shows aggression, movement and dynamics, which is not typical for the depiction of saints, especially on icons. At the bottom of the work is a snake. Some sources also say that St. George the Victorious did not fight with a serpent, but with a huge dragon. The beast is depicted in dark colors, almost merges with the nightly mist. George swung and spear pierces the writhing body of the monster. Spear artist depicted in red. Near the snake lies the human skull.